There are pros and cons to live in rented property. You might not have the same feeling or rootedness and security you do if you own your own place but at the same time, there are a number of responsibilities that don’t fall on your shoulders. So, even though you can’t do what you want with the property, you don’t have to worry when repairs need to be carried out. You landlord, whether you rent privately or through the council, will take care of those. Your main concern is making sure that your rent is paid. 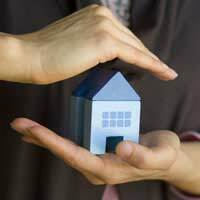 When you rent a property, whether it’s a house or a flat, who’s responsible for the property itself in case or fire, flood, or some major problem? If you’re a tenant, the goods news is that it’s not you. That devolves to the person who owns the property. At some point you’ll move out, but the property will remain, and it’s the owner who has to look after the building itself. Of course, if you’re the owner, you have to make sure that the property is fully insured, not only for disasters that might happen, but also to cover any damage tenants might do. You’ll have a surety bond, of course, usually equivalent to a month’s rent, which will cover many things, but wilful damage can leave you out of pocket.You’ll also need mortgage insurance (depending on the type of mortgage you have, it may well be stipulated in your loan agreement). As with your own house, it’s vital that you keep your coverage up to date, especially as house values have increased, and that you make your payments on time. Be very clear about what’s covered, and what’s not – you don’t want to have your property to be a flood victim, only to discover you’re not covered for the damage. Be aware, too, of the amount you’ll have to pay out of pocket first on any claim. As a general rule, the greater it is, the lower your premium. However, it’s worth finding a balance, so you’re not spending too much in case of a problem. In many ways, the tenants have it easy – all they have to do is insure the contents of the house – that is, the goods they own. Unfortunately, many don’t, trusting that there will never be a problem, and can sometimes end up losing everything in the event of a fire or major flood. Contents insurance is usually for a minimum of £40,000, although you can increase that if you have more, and items of particular value need to be noted and may mean a higher premium, or possibly an a separate policy in exceptional cases. Again, if you do make a claim, there will be a certain initial amount that you’ll have to pay before the insurance kicks in, but it’s generally quite reasonable. Always obtain several quotes before signing with any company for any insurance. Many brokers and sites will be able to do this for you. Consider not only how much you’re paying in an annual premium (you can usually pay by instalments over the year), but what the coverage is, how much your liability is – the factors that can affect a payout. You should also investigate a company’s’ reputation; you don’t want to put in a claim only to find that getting your money is like pulling teeth and takes forever. You want to deal with a company that’s prompt and on your side. I have applied for the right to buy. The council have agreed but the valuation is extortionate. I dont know what they have based it on but our council tax band is lower than the other six properties around ours. I have requested an independent valuation but I dont know how they are going to alter £190000 valuation to the real valuation which I believe should be around £95-100000. We have no back garden as the others, we have an un habitable basement that the council always refused to do any work on due to their estimated costs of £30000.It is brick on soil and has fungus growing on the walls.The council fitted new windows and door to this basement but then told us it was not to be used. We have not been given any information of land with the property or boundaries. The wooden window frames are rotten because the council refused to maintain them as they say they have no access to the back. However, the rider with the property states access/egress rights.We have only one room downstairs and the bathroom was adapted for a disabled person when we moved in. It has recently been altered by the council, who now say the band may change because they have improved the bathroom.